Wine exports surge…from Florida and New Jersey? The last few years have been ripe for U.S. vintners. 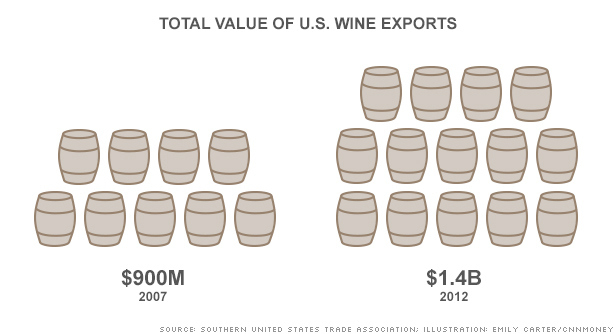 Wine exports have surged 64% since 2007. While most exports still come from California, other states are getting in on the game. New York has long been known for its growing wine industry, but Florida and New Jersey are nursing start-up vineyards as well. The top overseas destinations for U.S. wine are the U.K. and China, according to the Southern United States Trade Association. Most U.S. wines outside of Napa Valley still don’t have the cachet as, say, wines from the Loire Valley or Chile. So what’s the draw? If they’re drinking Trenton Cabernet, that’s probably a pretty safe bet.